Our Premium Back Draft Damper is a non-mechanical in-line one way air flow valve that requires minimal pressure to operate, has no moving parts and tested to UL 723 standards. Get the full force of your fan with this non-restrictive damper which fits snugly inside the duct. 5 sizes available. Our Premium Back Draft Damper is the ultimate one way air flow valve, designed to overcome the inefficiencies and limitations of traditional gravity or butterfly dampers. 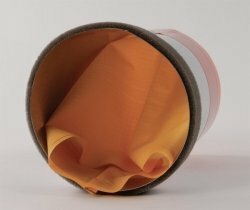 The damper consists of a specially formulated fabric sleeve attached to an outer metal sleeve. The fabric sleeve will allow air to pass through in the desired direction of flow with miniscule reduction in airflow. Our Premium Back Draft Damper is the best damper available. It is superior in that it allows unrestricted airflow in the desired direction without reducing system efficiency. It is silent, produces no metal clanging sounds, tested to UL723 standards and can be installed in horizontal or vertical ductwork. Specifically designed to stop backdrafts from your clothes dryer, bathroom exhaust fan, kitchen fan, pellet stove, direct vent water heater and direct vent furnace. Tested to UL723 standard for flame resistance. Available in 4, 5, 6, 7, and 8 in. sizes! Installs easily - simply slide into duct. Available in 4, 5, 6, 7, and 8 in. sizes! Installs easily - simply slide into duct.